So Katies have rebranded as I mentioned on Facebook earlier in the week, and word on the streets is that they are moving to target a younger demographic. I'm down! I've had many discussions with people my age and thereabouts regarding a lack of affordable and age-appropriate high street fashion for us. It's like at my price point it goes from Supre to Millers with nothing in between. Now, don't get me wrong, Kmart, I still love you, but sometimes I need something that's going to be a bit more durable. Some of my favourite pieces of this year have been from Katies and I have added to my collection with some new additions in the last few weeks, thanks to favourable sale situations. There is currently 30% off new season styles for VIP members - use code SS16 at checkout or take your email voucher in store. The top three items are what I've nabbed for myself and the bottom two are on my hitlist. Look out for the #AlmostPoshStyleCost round up at the end of the month to see if I did get them! No pressure or anything but I've just received an email saying the cold shoulder top (top left) is nearly sold out so, you know, don't dilly-dally. 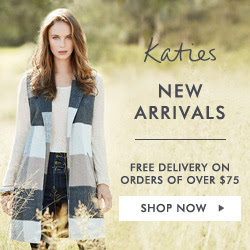 Anything from the new look Katies take your fancy? This post contains affiliate links. By clicking through and purchasing, you don't pay any extra but I earn a small amount of coin to put towards those pants. For more information, please see my PR & Media policy.